Moist Personal Lubricant , 1oz Travel size, or quick on the run play. Small tube, sealed until use. Water based fragrance free non sticking personal lubricant perfect for any encounter. 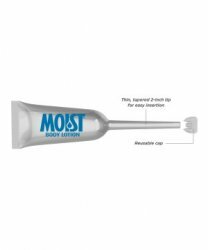 Insertz are the no-mess applicators make it easy to get your favorite Moist lotion to stay exactly where you want it. The thin, extra-long tapered tips make application a breeze. They're smooth, easy to squeeze, and best of all, the resealable cap allows you to reuse later.